One of the commoner shore bugs in Britain, usually occurring on open patches of ground, among litter in marshes and at the margins of ponds, lakes, streams and rivers. The map is based on records from NBN Gateway, with yellow dots showing pre 1990 records, reds dots 1990 – 2015 records and red on yellow dots overlapping records. 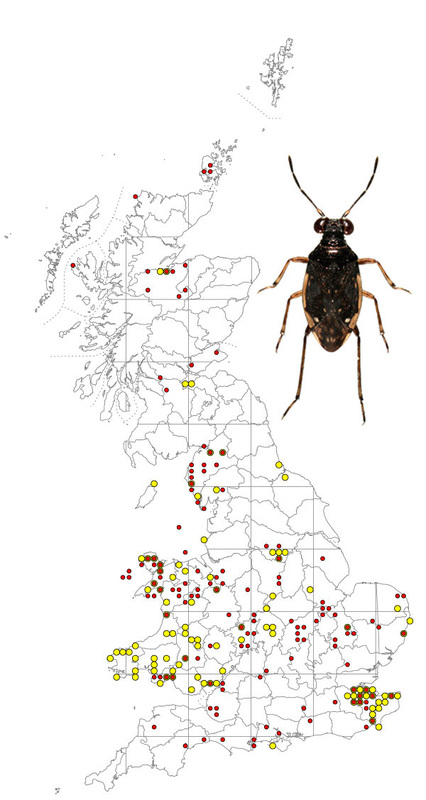 A fairly widespread species in England and Wales, although apparently absent from the south-west. In Ireland it is common in the north, rarer in the south. Chartoscirta species are characterised by slightly concave lateral margins to the pronotum and by ocelli (the paired simple eyes between the large compound eyes) which more or less touch (see below). The two other species that occur in the UK, C. elegantula and C. cocksii, which are much less common, have dense, long pubescence, while in C. cincta the pubescence is short and sparse.